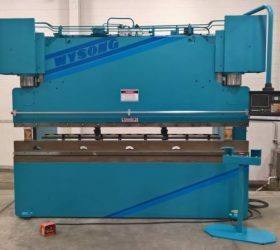 A press brake is a machine used to make repeatable, precise, and reliable bends in metal sheets. Brakes are classified according to tonnage and bed length. 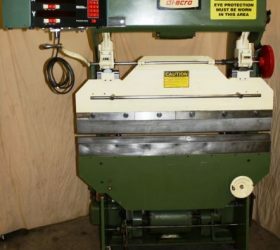 They can be fitted with various types of punches and dies to control the bend of the sheet. Most now come fitted with an automated backgauge that aids in positioning and holding the sheet, greatly increasing repeatability. A press brake is a fabrication machine that is usually used with metal blanks rather than rods. As such, it is most commonly found in fab shops. Whereas a folding machine is used for light, thin sheets, press brakes can exert hundreds or even thousands of tons of force, leading them to be used for huge steel plates and other heavy-duty bending applications. Press brakes can produce either small parts or very long pieces with minimal tooling. They are useful in both low and medium production runs. For answers to your questions or more information on press brakes call Liberty at 847-276-2761 or send us an email sales@libertymachinery.com. 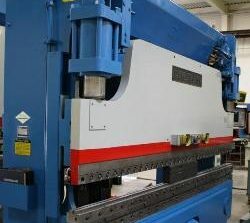 Liberty Machinery buys and sells all types of press brakes. 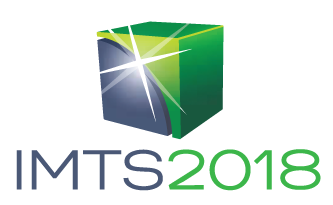 We are your trusted source for high quality press brakes and other used equipment. 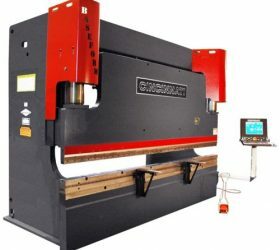 Most basically, a press brake has three parts: the top tool or ram, the bottom tool, and the mechanism driving the ram. In the animation to the right, the optional back gauge isshown in red. While the main operation of all press brakes is the same, the mechanism used to exert force on the ram that shapes the part will differ. The smallest press brakes will use electric motors to drive a flywheel that presses the ram down. These are called mechanical presses. For projects that need more force (such as thicker pieces), hydraulic presses use two paired hydraulic cylinders on either side of the press. These are also usually safer to operate and can be highly programmable. There are also pneumatic and servo-electric press brakes, but these are much less common. Several different bending operations can be performed. In the example shown here, we see the most common of these--an air bend. The name refers to the gap between the sheet and the bottom of the V. Air bending never presses the sheet completely flush with the tooling. Other possibilities include coining and bottoming. Liberty is always looking for used press brakes to buy for inventory. Contact us and let us know what you have for sale. We’ll be happy to give you a free quote. 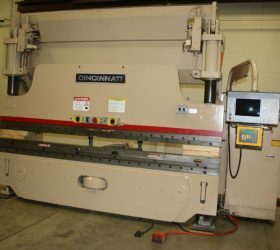 See our used Press Brakes for sale. Advantage Fabricated Metals, "Press Braking Process," http://www.advantagefabricatedmetals.com/press-braking-process.html.